A crunchy, spicy topping for your ramen, this is easy to make and be created in advance so that it is to hand when you are ready to serve. Bring a large saucepan of water to boil and blanch the beansprouts for two minutes. Combine the seasonings in a bowl and add the beansprouts, mixing well to full coat them. Sprinkle with the sesame seeds. 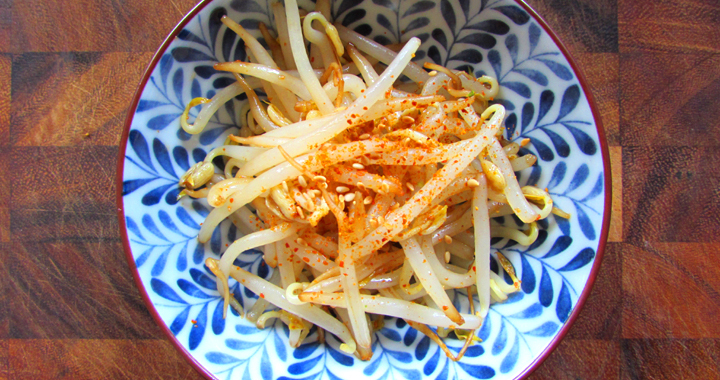 Allow the beansprouts to cool before serving on top of ramen. Posted in Recipes, Toppings and tagged Toppings.